Farro is a great grain with a slightly nutty taste and chewy texture that can be used in many different recipes. I was first introduced to farro when we bought our farmhouse in Umbria as farro is used frequently in many Umbrian dishes. We often use farro as a base for salads and you really can add almost any ingredients to the farro and create an endless number of flavors. 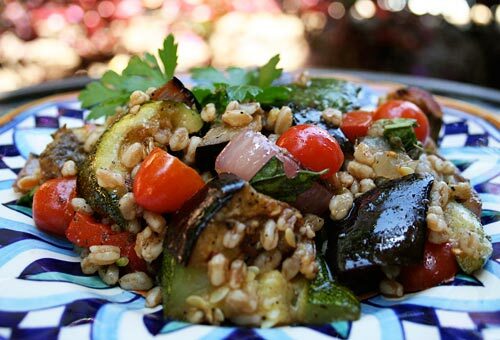 In this recipe, I chose to mix farro with my favorite grilled vegetables but you could add just about any vegetable you chose. Grilled asparagus, mushrooms or artichokes would also be delicious in this salad. In place of the capers you could add pitted, sliced olives or even lightly toasted pine nuts. We often make this salad for lunch but it is also perfect to pack for picnics or outdoor barbeques. Farro is a close cousin to spelt, and similar to barely, so you can substitute either for farro if it is easier to find. These grains are rich in protein and fiber and are therefore a great alternative to meat. Farro is an ancient grain that works extremely well in salads. Cook the farro in lightly salted boiling water until tender to the bite but still just a bit chewy, about 20 minutes. Cut the eggplant, zucchini, and onion into 1 1/2 inch slices. Cut the pepper into four pieces after coring and seeding it. Mix well and serve on four individual plates.